Android is creating waves when it comes to Smartphone market share, Every week I hear about the launch of new Android based phones. I have always maintained that in next 12 – 24 months Android will be number 1 Mobile Operating system. Given the open source nature of this platform, more and more mobile manufacturers are embracing it. HTC & Motorola were the early adopters of Android Operating System and they reaped rich rewards on that. Coming back to Smartphone Sales, First quarter of 2010 saw Android Phones sell more than iPhone for the first time (in USA sales). The research firm NPD’s wireless market research reveals that based on unit sales to consumers last quarter the Android operating system moved into second position at 28 percent behind RIM’s OS (36 percent) and ahead of Apple’s OS (21 percent). According to NPD’s Mobile Phone Track, smartphone sales at AT&T comprised nearly a third of the entire smartphone market (32 percent), followed by Verizon Wireless (30 percent), T-Mobile (17 percent) and Sprint (15 percent). Android based Droid Incredible is touted as one of the best phones available in the market and reportedly doing extremely well. Based on the growth that Android is seeing, I think it should not take more than 8 –12 months for it to reach the number 1 position in Smartphone category. In couple of months we will also see iPhone’s 4th generation – it will be interesting to watch how much dent it makes in Android’s growth. 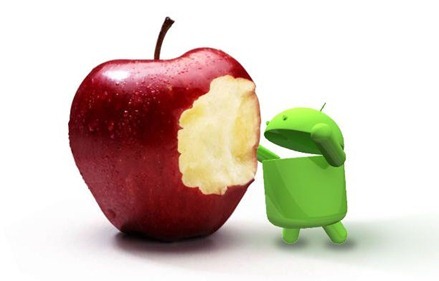 yes the droids will eat the apples… I used both the OS and realized that iphone OS is sluggish and full of restrictions… where as android rules in almost everything. I am using HTC HD and Sony Ericsson Arc currently. I cannot find the date of the article which is a bit irritating. Kindly take care that there is a time stamp at the beginning of the article. My Droids are taking over your world and we will do it in just a few of your earth years! I predicted we would put an end to Palm. See, already that has happened. Droids are here to stay. R2D2 here and I know my Droids.